Description: The game is in fact a re-branding of Ashura (known as Secret Commando in Europe), which explains why there is a second character on offer. Box Text: You are Rambo, the super hero of the movies. And you come to life on your own screen. You must go deep into enemy territory to rescue your comrades from concentration camps. Blow those camps. And escape with your skin. It's no picnic. You're menaced by infantry. Artillery. Flame throwers and rocket launchers. Everything the enemy can throw at you. So you must use every tactic at your command. Your weapons? Your M-60. A supply of arrow-bombs. Your savage strength. And steel nerves. Play the game by yourself. Or with your partner. Alone or together, you'll find yourself in the middle of enough color and action for a battalion to take on. And remember. You take no prisoners. 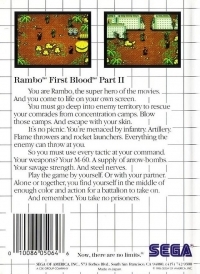 This is a list of VGCollect users who have Rambo: First Blood Part II in their Collection. This is a list of VGCollect users who have Rambo: First Blood Part II in their Sell List. 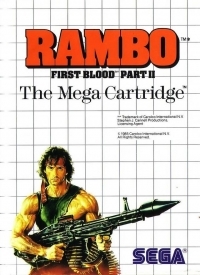 This is a list of VGCollect users who have Rambo: First Blood Part II in their Wish List.